Will is the word that comes to mind after watching the Cavs fight back from a 3-1 deficit and take the title last night. Of course, the Warriors did the same thing in the western conference finals against the Thunder. Those two series were two of the best NBA playoff series I’ve watched and I watched both cover to cover. LeBron James is 31, at the peak of his career and capabilities, with six consecutive NBA finals appearances. He’s mature, seasoned, and understands what it takes to prevail. He’s left the court three times in those six finals with the same feeling that the Warriors left with last night. And although winning is what is celebrated, and rightly so, losing is what teaches you things. LeBron knows these things now. The Warriors are just learning them. They will be better because of this outcome although I suspect they aren’t feeling that today. I think the Warriors are a dynasty in the making but they need to understand what LeBron has learned over the past ten years. Last year’s win came too easy in some ways. I think they will be better next year and I bet they won’t be as concerned by how many wins they get in the regular season. 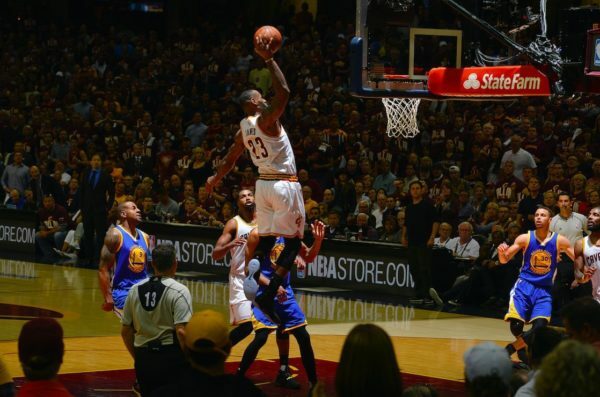 I think this championship is LeBron’s crowning achievement in a career full of achievement. There may be more rings for LeBron but I don’t think there will be another that means as much as this one. And this image, which I’ve already posted once on this blog, will stay with me for a long time. It reeks of the will to win.